Adobe has released a new version of lightweight photo editing software Adobe Photoshop Elements 9.0. Adobe Photoshop Elements is an image and photo management software for Windows and Mac OS X which is designed to help photographers in managing collection of images, and doing post production work, with viewing, organize, edit, create and share extraordinary photos and video clips. Adobe delivers powerful new technology to equip every consumer with the ability to achieve professional results easily and quickly. It also allows users to access layer masks for composting richly layered photos and conveniently share photos and videos directly to Facebook or creating interactive Online Albums with animated templates. Retouching made easy via the perfect portraits feature. 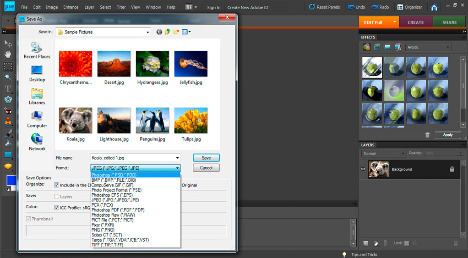 Auto-Analyser – automatically searching collection photos and assigning a tag based on quality, such as lighting, focus or contrast. Adobe Photoshop Elements 9 for Windows and Mac is now available for a suggested retail price $99.00 (aff) with upgrade license priced at $74.00 (aff). 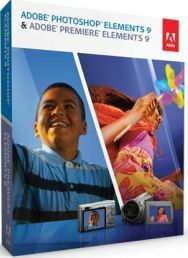 There is also Adobe Photoshop Elements 9 and Adobe Premiere Elements 9 bundle deals, which priced at $149.00 (aff) per full version license or $112.00 (aff) per upgrade license. Adobe is offering free download of Adobe Photoshop Elements 9.0 trial evaluation version, which offers full functionality. However, to download Adobe Photoshop Elements 9.0 trial from Adobe requires users to create or sign into Adobe account. To workaround Adobe account requirement, end-user can try to use the following direct download link to setup installers of Adobe Photoshop Elements 9.0. Note: The trial version can be converted to full production and fully licensed version by simply entering a genuine activation product serial key number to activate the product and unlock all restrictions. Important: For the direct download links of Adobe Photoshop Elements 9 to work, downloader has to visit and click on “Try” link of at least one Adobe product in order to set the proper download cookies which permit direct download. For example, just click here, which is the link to download Windows version of Adobe Photoshop Elements 9. Then, click on direct download link above, with no login necessary. If the step above still does not allow direct download, register and/or login to Adobe account. Otherwise, an “Access Denied” error message will be displayed indicating you don’t have permission to access the file. Note: The Windows version of setup installer contains 2 parts, which ends with .exe and .7z file extension. Both files must be completely downloaded and placed inside the same folder for the self-extracting setup to work.